Modular Barn is the barn that's either delivered completely built or delivered partially built in sections and assembled on site. Completely Built Modular Barns may include portable horse sheds, shedrow barns, small storage barns and similar buildings that are built at a manufacturing facility and delivered on flat bed trucks & trailers. These types of barns are delivered fully built and in most cases may be put in use almost immediately. The advantage of such barn is its affordability and fast turn-around. In most cases, barns like these can be completely built and delivered within 2-3 weeks from the order date. We think it's worth mentioning that most of the manufacturers offering these types of barns are located in Pennsylvania and are mostly built by the Amish craftsmen. Partially Built Modular Barns include, but not limited to center aisle horse barns, barns with big front overhangs (lean-tos) and in some cases storage barns. These types of barns are generally larger and require some on-site assembly. As you can see from this picture, the modular boxes were delivered completely built and the roof is being built on-site. There are some barn manufacturers that might partially or even completely build the roof and put it in place by using the crane or forklifts. 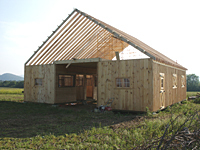 A Modular "Monitor Barn" is a good example of a pre-built roof where barn lower sections and the center upper section are delivered in 3 pieces and connected together usually in 1 or 2 days. It is hard to say with certainty which barn is built better or which barn is more affordable. The quality of construction and the price varies from builder to builder. Generally though, modular barn has to be built sturdier in order to withstand stresses during delivery and unloading. When building modular barn sections (boxes), manufacturers normally use more material throughout construction and brace the walls better in order to make the sections sturdy. As for the price, modular barns are not always cheaper, however. One might think that modular barns should cost less than pole barns, since manufacturers save time & money by building most of the modular barn components at their location. But when you figure delivery costs associated to deliver oversize modular boxes, required concrete foundation, and in some cases equipment rental (crane, forklift, etc. ), the cost might end up being the same or in some cases even higher than a regular pole barn built completely on site. In addition, the construction of a modular barn requires better site access in order to deliver the oversize boxes and other components. The modular barn, however, has few advantages over the pole barn. These advantages include faster turn-around and less time spent on site by a construction crew. If you are looking into purchasing a modular barn, try to weigh all the options, compare the price, and most important, compare the construction specifications to make sure that the barn you are buying is properly built. And remember, it is wrong to automatically assume that a modular barn is less expensive and that it's not built as good as any on-site built barn. We have seen some modular horse barns that were built significantly better than any pole barn, but, we have also seen some modular barns that were built very poorly in order to keep the cost down. This is why it's so important to get a detailed list of construction specifications from the builder and to see how their barn is built.